Preston’s is North Scottsdale’s premier venue to host your most trusted clients, employees, family and friends. 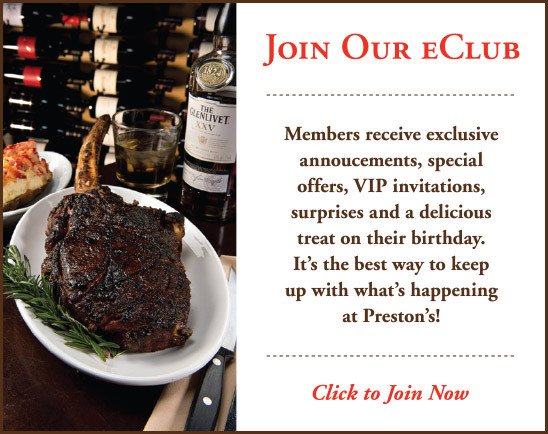 Make Preston’s your destination for business meetings, private parties and special events. Our management team will help you plan your private function tailoring our facility to match your needs. We have four areas to choose from; The Heritage Room, The Delmonico Room, Chef’s Table and Upstairs Lounge. Each can be easily configured to your particular requirements, from a conference table to a sit-down dinner or a cocktail party. To reserve the entire venue, contact our events concierge for exclusive private buyout. A complimentary 52″ flat screen television may be reserved for your event. Perfect for any function. Adjacent to our service bar on the East side of the restaurant, and accessible via private entrance. Includes an inviting fireplace and courtyard view. The Heritage Room can be combined with the Delmonico Room for large events. Accommodates: 10-50 guests and 65 guests when combined with The Delmonico Room. Minimum Food & Beverage: $1,000. Quiet, semi-private and perfect for smaller functions. Includes an inviting fireplace and courtyard view. Conveniently adjacent to our service bar. Located in an intimate, glass-enclosed room near the bar, ideal for small parties or business meetings. Our Upstairs Lounge takes private dining to new heights offering panoramic Pinnacle Peak views and spectacular Scottsdale sunsets. Inside space includes a piano, televisions, full bar, and fireplace. The patio offers both covered and open seating, fireplace, fire pit, and private entrance. Accommodates: 10-30 guests inside and 10-30 guests on the patio. Minimum Food & Beverage during service hours: Wednesday – Saturday $5,000, Sunday – Tuesday $1,000. Closed Memorial Day through Labor Day. All private dining reservations require minimum food and beverage. Minimum charges does not include tax, auto gratuity, to-go food, corked bottles of wine or gift cards. If the minimum food and beverage has not been met a room charge will be applied for the difference. We require a credit card on file to hold your reservation. It will not be charged until the day of the event or if you cancel your reservation within 14 days of the event. Cancelation fee is $250. There is no charge if you cancel 14 days prior to the event. All reservations will have a 20% gratuity added to the food, beverage, and if applicable, room charge subtotal. Sales tax is 7.95%. Let our special events concierge help you plan your next event by filling out the form below.